Color Filters by Date. 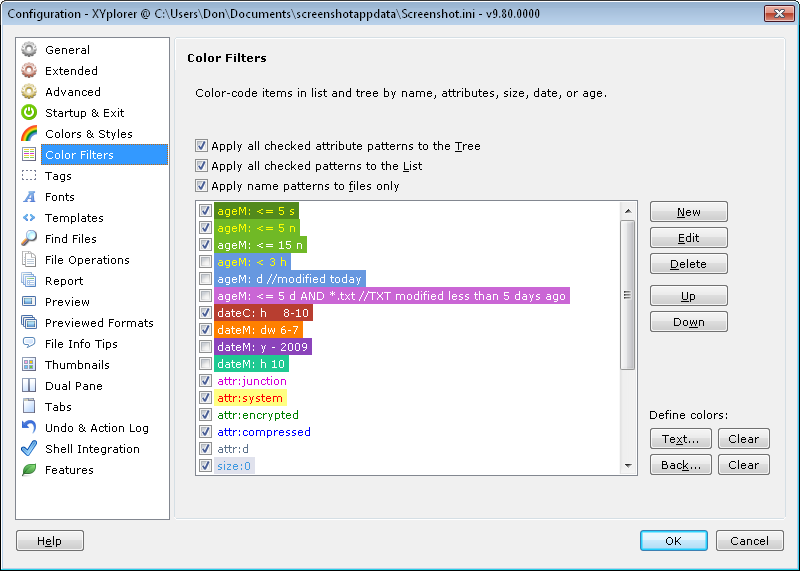 Now you can, for example, color all files that were modified on a certain day, or that were created before the year 2008. 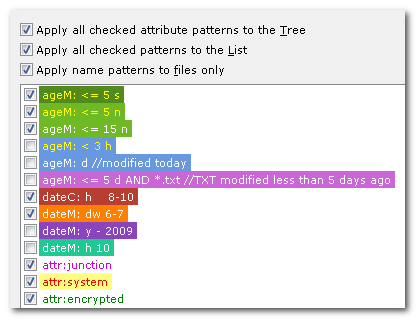 Now you can as well, for example, color files that were created from 8:00-10:00 in the morning (on any day), or last modified on a weekend, or last accessed on any Valentine's day. The syntax offers a lot of intuitive possibilities, here are some examples. Color Filters by Age. Now you can, for example, color all files that were modified today, or yesterday, or last week, or that were created more than 10 years ago. Color Filters. Now you can combine color filters of any type and number with a Boolean AND. For example, give a nice blue back color to all TXT files larger than 1 MB and modified yesterday. Serial Rename. Here's killer feature for everybody who frequently needs to do lots of manual renaming: Serial rename by Up and Down keys! Probably the best part is that the current caret position (e.g., your caret is at the 8th letter) is kept! 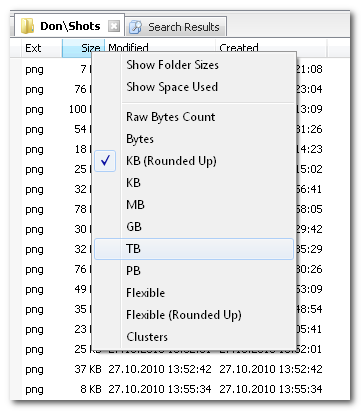 Renaming files in a list now is almost like moving and typing around in a multi-line text box. You will never want to miss it. Note that this feature is optional and can be toggled in Configuration | General | Renaming. FYI, serial rename by (Shift+)TAB key is always enabled by design, independently of the above. Toolbar. 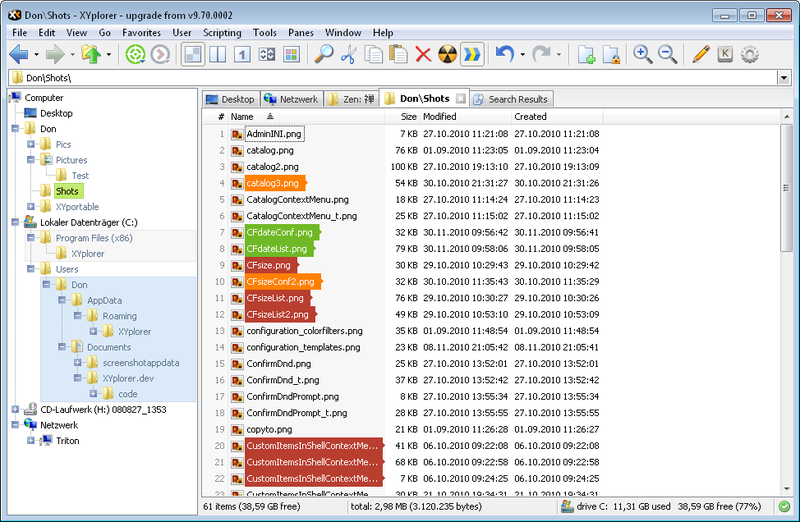 New buttons "Move to Other Pane" and "Copy to Other Pane" make basic dual pane file management a snap. 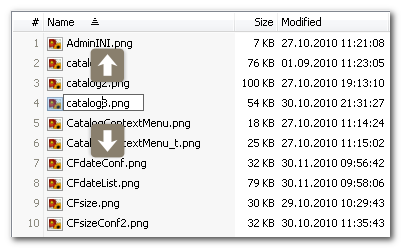 They work identically to the same-named commands in menu Panes and have small context menu. Suffix number to copies: Suffixes a number (formatted as defined by the template in Configuration | Templates) to the files being copied. Affix current date to copies: Affixes the current date (formatted as defined by the template in Configuration | Templates) to the files being copied. Affix last modified date to copies: Affixes the file's last modified date (formatted as defined by the template in Configuration | Templates) to the files being copied. Suffix number to existing: Suffixes a number to the existing files. Affix current date to existing: Affixes the current date to the existing files. 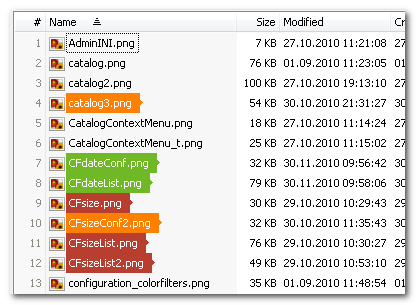 Affix last modified date to existing: Affixes the file's last modified date to the existing files. Convert MB to KB (for German locale use "1,34 MB"). Convert KB to MB (for German locale use "1.372,16 KB").